What Trees Absorb the Most Carbon Dioxide? Respiration is the process by which a tree takes in carbon dioxide and releases oxygen. The amount of carbon dioxide a tree can hold is called carbon sequestration. 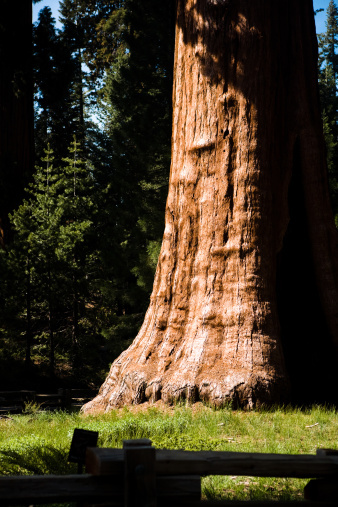 They sequester this carbon dioxide by storing it in their trunks, branches, leaves and roots; the best trees for carbon dioxide absorption will have large trunks and dense wood. Fortunately for us, many trees fit this description and they are readily available. 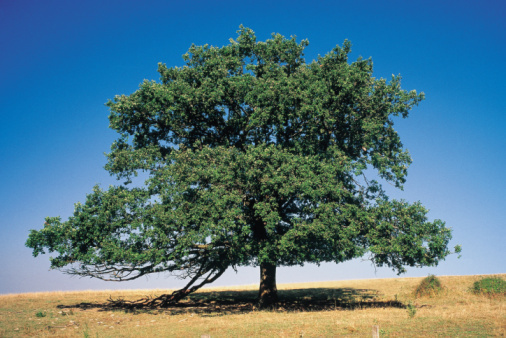 Oak trees are one of many carbon sequestering trees. There are quite a few pines appearing on the lists of trees that sequester a lot of carbon. The Ponderosa, red, white and Hispaniolan pines (Pinus spp.) are a part of many forests throughout the world, but they can also be good landscape plants. Granted, they will need a lot of room, but if you have the room, they are well worth the trouble. Ponderosa pine grows to be 200 feet tall, has long needles, and orangy bark. Red pine grows to 80 feet and has reddish bark. White pine has soft, frosty green foliage, and Hispaniolan pine grows in the higher elevations of the Caribbean islands. While pines dominate in carbon sequestering ability, there are other evergreens that also act as great carbon dioxide absorbers. The tall Douglas firs (Pseudotsuga spp.) of the Pacific Northwestern states and southwest Canada form large carbon sinks. The bald cypress (Taxodium spp.) is a deciduous conifer native to the wet and swampy areas of the southeastern states and absorbs large amounts of carbon dioxide as well. Douglas firs are popular Christmas trees, and both trees are popular landscape plants. Oaks (Quercus spp. ), having large canopies and dense wood, have the characteristics needed for great carbon sequestering. Scarlet oak has shiny green leaves that turn brilliant red in fall. Red oak grows to about 90 feet and has great fall color. Virginia live oak isn't like most oaks we imagine; it is semi-evergreen and has long, shiny leaves that have no lobes. It can get to 45 feet tall and grows primarily in the southeastern states. Scarlet and red oaks are popular landscape trees, but Virginia live oaks are mostly found in native plant stores or websites. While oak is the genus with the most carbon-absorbing species, there are other notable deciduous trees that sequester carbon as well. The common horse-chestnut (Aesculus spp. ), with its white spike of flowers and spiny fruits, is a good carbon absorber. The black walnut (Juglans spp.) bears hard nuts and can be messy as a landscape plant, but great in a grove. The London plane (Platanus spp.) and American sweetgum (Liquidambar spp.) sequester a large amount of carbon and are great landscape trees. The American sweetgum also has a brilliant fall show of multicolored leaves.